The plant "Eugenio Montale", owned by Enel, was located in 1962 in an urban, residential and industrial area near the center of the city centre of La Spezia. The power plant, fueled first by fuel oil and then coal, reached in 1968 its maximum power of 1835 MW. 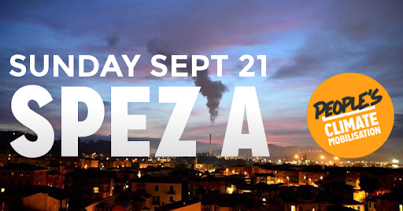 The city of La Spezia is situated in a bay surrounded by hills. All along the coast line there are industrial - commercial port, shipyards, military arsenal, LNG terminal - and areas of special environmental interest - over ten landfills, one of toxic waste (already classified in the national interest for land remediation). Behind the town an area previously occupied by a refinery has recently been partially reclaimed. There are natural parks, regional and national, and UNESCO sites. Since 1963 citizens living in the suburbs neighboring the plant began to complain of crops damage and an extensive mistrust of issues of general welfare because of the combustion residues (sulfuric acid mist) arose. In 1971, in the absence of guarantees for the citizens health, a municipal ordinance imposed the operation with liquid fuel sulfur content not exceeding 1%. The real conflict and mobilizations began in the late '80s and culminated with a national referendum in which the community decided on shutting the plant, reducing its natural gas operation production by 50% and plant closure by 2005. 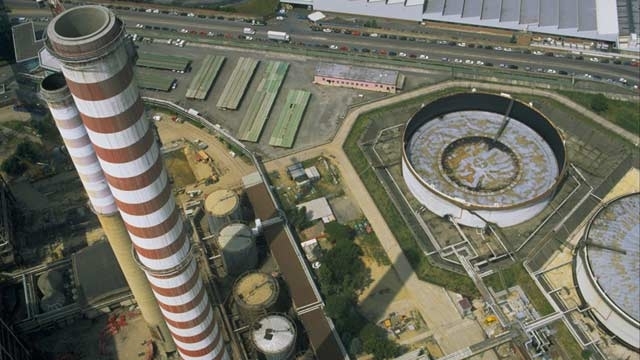 In 1991 the mayor closed the plant for violating the law Merli (319/76) on thermal discharges. The plant was reopened by the mid 90s and has been involved in the work of environmental improvements that have resulted in the current configuration of 1280 MW. Already since 2005 the plant has reduced energy production with the use of methane, which has dropped to around 20% in 2008 and less than 5% in 2010 to almost exclusive benefit of the coal use. As witnessed by the environment-health surveys carried out between 1995 and 2004, the plant has compromised the health of citizens (higher incidence of lung cancer in women) contaminating the surrounding environment: air, soil, flora and fauna. In 2007, on the basis of new European legislation, Enel has requested the Integrated Environmental Authorisation (IEA), which was released in 2013: with 5 years of delay and about the production with prevalent use of coal. 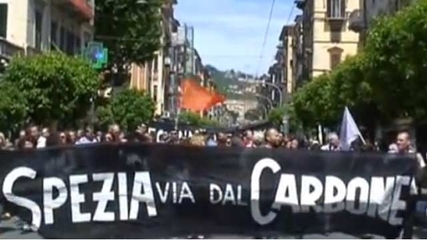 In 2011 the Committee "Spezia Via Dal Carbone" was created, and has conducted various research, information, awareness, and mobilization in order to obtain 1) the definitive closure of the coal plant; 2) the development of new and detailed health advice; 3) information and public involvement in decisions regarding the plant; 4) the establishment of an equal Permanent Observatory between local authorities, technical bodies and committees to control the management of the plant after the issue of the IEA. From the month of January 2012 numerous complaints of some citizens who witnessed the abnormal noise and atmospheric emissions conveyed and disseminated were presented to the judiciary. Later, in 2013, Harp Liguria has initiated a monitoring of Total Suspended Particles in the plant and in the harbor area, concluding that the air quality is not worse than the rest of the city. A court case alleging the omission of control over emissions by the authorities has also been referred to thecourts for the failure to monitor the health status of the population. The case is partly corroborated by the recent report ISPRA (12/2014), that documents the doubling of atmospheric emissions of NOx and SOx (typical pollutants from coal combustion) to La Spezia from 2000 to 2012. None of the other 72 Italian cities considered in the report increased emissions, which are reduced in all cases and in some even halved. Project Details The Enel plant was inaugurated in 1962 and in the sixties was the largest in Europe, with a 5% contribution to national energy production. In addition to the plant for the production of energy, the settlement includes two large open areas used for the carbon deposit and connected by means of a conveyor belt of over 1.5 Km, that reaches the coal ships. The obsolete structures do not guarantee containment of diffuse emissions according to the limits achievable with the use of new technologies. The plant has steadily reduced its efficiency by increasing its emissions, consumption of water from the aqueduct and waste production. 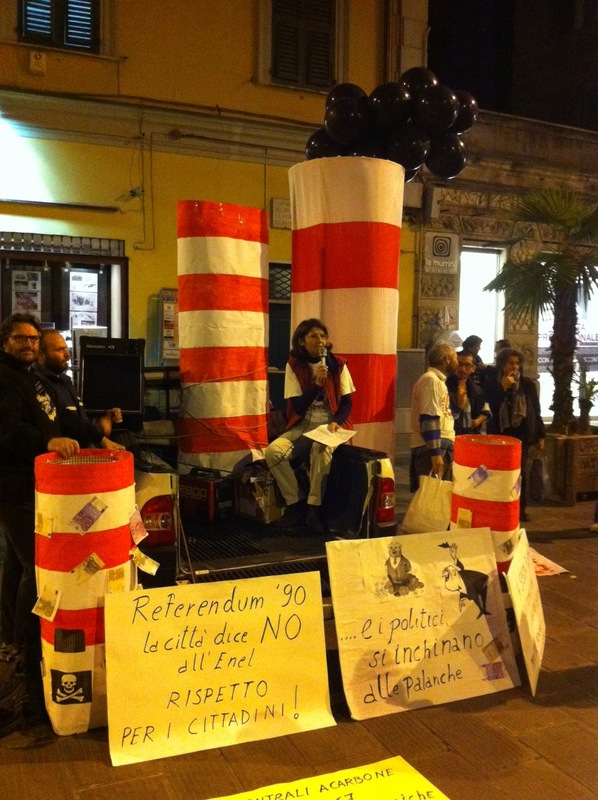 Development of Alternatives The local committee SpeziaViadalCarbone mobilised for the disclosure of the coal power plant and ask for new and ecologic options for the use of the area. Alternatives aim to convert the local economy. Why? Explain briefly. The mobilisation didn't reach the objective of the protests. Nevertheless since 2011 the local committee managed to raise public attention on the importance to protect environment and health and to reactivate a historical conflict. 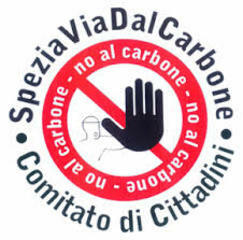 LaSpeziaViaDalCarbone Commitee conducted research, disseminated information, implemented activities of awareness and mobilization, revitalised participation on important health issues and strengthened citizens' will to participate in decision-making processes regarding urban development.